Those of you who use YouTube most have learned the secret to making it even better—find the channels you love and subscribe, subscribe, subscribe. Last year we began to make it easier to subscribe to the channels you care about by introducing a Guide on the home page. When you add subscriptions to your Guide, you organize YouTube around what you like, available whenever you watch YouTube. Today, we’re taking the next step by bringing your subscription-filled Guide with you across both the site and all devices, as your best source of what to watch on YouTube. Just subscribe to your favorite channels and the Guide lets you know when there are new videos waiting for you to enjoy, suggests the latest and greatest channels you might like, and shows you what your friends are sharing across the web. You’ll also find the Guide and your subscriptions on apps across hundreds of millions of devices including Android, iPhone, Playstation 3, Google TV and more. You come to YouTube to watch the videos you care about, so it’s important that the videos stand out. In this new layout, you’ll find the most crucial elements are front and center when you watch a video: the video is right at the top of the page and the subscribe button, social actions and video information are all combined directly below the player. 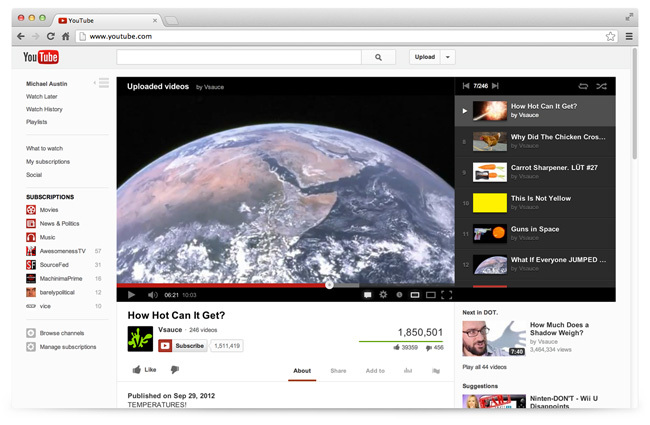 Playlists are now available to the right of the video so you can browse through while you watch. You’ll also see this cleaner and simpler design across the entire site. We’d love to get your feedback on these updates, so we’ll be hosting a Google+ Hangout on Air and a Reddit IAmA in the coming weeks--stay tuned here for details. 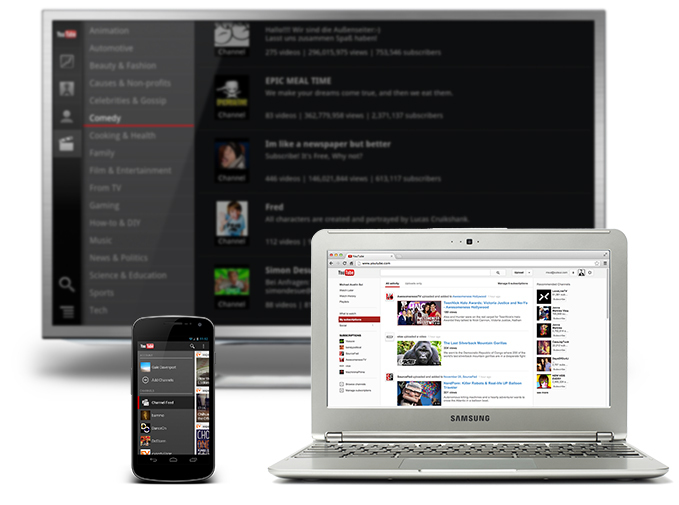 If you’re a YouTube creator, you can learn more about these updates on our YouTube Creator Blog. Nice post... Thanks a lot for sharing this post. Great help, thanks for sharing such a nice information.. i like your post. really good work. keep it up. I truly liked it. I was searching for such information. Thanks for sharing such an helpful post. This Message occurs if the device has entry passcode incorrectly too many times, you will see message say that ( iPhone Disabled try again in 22 million minutes ) . By the way passcode do not have the chance to enter again to unlock device . YouTube Next How-to Guru: Could you be next?